Swiss watchmaker Alpina continues to embrace the world of smartwatches and this time it's by adding e-straps to its new Shadow Line collection. Made up of six timepieces that take design inspiration from its Startimer Pilot Automatic collection, all of the watches come equipped with a leather e-strap. That brings connected features including activity tracking, sleep monitoring, inactivity alerts and should offer a week's worth of battery life. The strap is rechargeable too and can be powered back up via a USB charger. All of the data is synced to Alpina's companion app (iOS or Android) where you can also make use of features like dynamic coaching and cloud backup to protect your data. In terms of design, you have the Startimer Pilot Automatic Shadow Line ($1,285), which features a 44mm watch case with a dark grey dial and comes in a rose gold-plated stainless steel case. It's also water resistant to up to 100 metres so you can take it swimming and it features an automatic caliber movement. The Startimer Pilot Automatic Shadow Line ($1,050) features a 44mm, black stainless steel case with a dark grey dial. There's also a version that packs a dark blue dial, but looks identical in every other way. The Startimer Pilot Chronograph Big Date Shadow Line ($995) is another 44mm option with a stainless steel body, 10 ATM water resistant rating, but features a Swiss Quartz movement. It's also available with a black or brown leather strap. 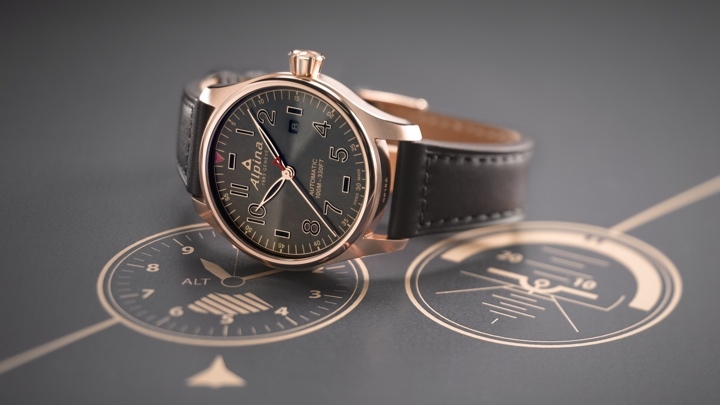 In addition to the new Shadow Line range, Alpina is also launching a new Alpiner 4 Automatic watch. The 44mm, automatic caliber movement sports watch features a black stainless steel case, a turning compass bezel and has been slapped with a 10ATM water resistance rating. It also comes with the same e-strap as featured on the new Shadow Line collection. You can expect this one to set you back $1,495. There's no details just yet when all of the smart strap-toting watches will be available, but we'll keep you posted when you can have one of these luxury watches with connected smarts on your wrist.